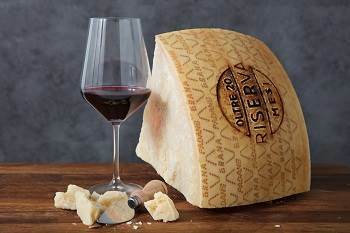 Cheese and wine are key elements in the history of food, and are often the product of the peculiar cultural experience built up over the years in a given geographical area and of a language of individual of taste which is difficult to sanction into precise and universally accepted rules. But while subjective sensibility leads to an understandable degree of anarchy in taste, there are nevertheless some rules that enable us to sanction certain basic principles. These sometimes lead the taster to approve of traditional accompaniments and other times to revolutionise them, creating new and stimulating combinations that become universally shared. 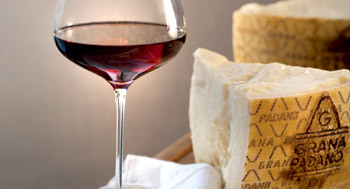 The relationship between cheese and wine is one of the most versatile matches, and combining the two produces exciting results. Combining wines with food is inextricably linked with knowledge of their chemical and organoleptic properties, which can distinctly influence the taste sensations we perceive when we eat the food. It is no coincidence that local dishes and local wines have always gone hand in hand, integrating with each another in a homogeneous blend of sensations and flavours. The same is true of cheeses, which, based on their different characteristics, should ideally be combined with typical local wines. When carefully and individually selected, these wines will almost always produce the most successful combinations if we know how to distinguish between the various types of cheeses. Those shown here are some of the ideas adopted by the Italian Sommelier Association. Italy offers a varied wine production landscape highlighted by a veritable mosaic of highly diverse wines that combine perfectly with every kind of cuisine, both national and international. Over 350 cultivars are used in Italian winemaking, giving rise to a wide range of typical and traditional wines from across the Italian peninsula which can be matched with this key product in the Italian art of cheese making at its three different ageing stages: Grana Padano PDO, Grana Padano PDO“More than16 months”, Grana Padano PDO Reserve. 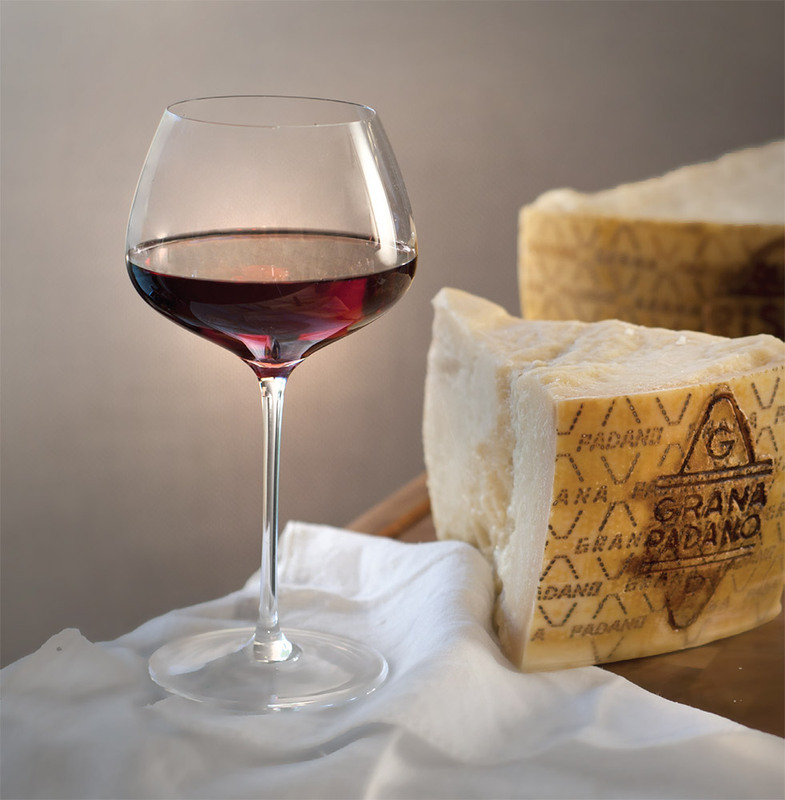 Grana Padano PDO ias yet unmatured aromasand evoke the fragrance of milk and cream. The taste buds enhance its sweetness and fairly high fat content. Its hint of seasoning stimulates salivation and it should, therefore, accompany with smooth wines, fresh in acidity, with a touch of tannin and slightly warm in alcohol, with fruity though never overpowering aromas. The first of these is extra dry “bubbly” Prosecco, slightly flowery, delightfully light and with a soft, immediate flavour. Heading southwards from the north, we will be able to appreciate some of the best Italian white and red wines intended for immediate consumption. 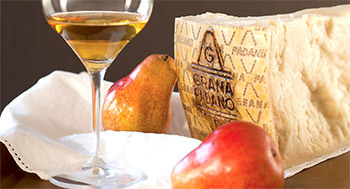 GRANA PADANO PDO "MORE THAN 16 MONTHS"
The Grana Padano PDO “More than16 months” is still characterised by aromas of milk and cream but at the same time has developed more complex fragrances of butter and hay. The smell sensations are followed by a circular and constant flow of taste, which brings out fairly savoury flavours and in turn stimulates salivation. After being consumed, Grana Padano at this ageing stage leaves a light, thin and characteristic coat of fat on the tongue. 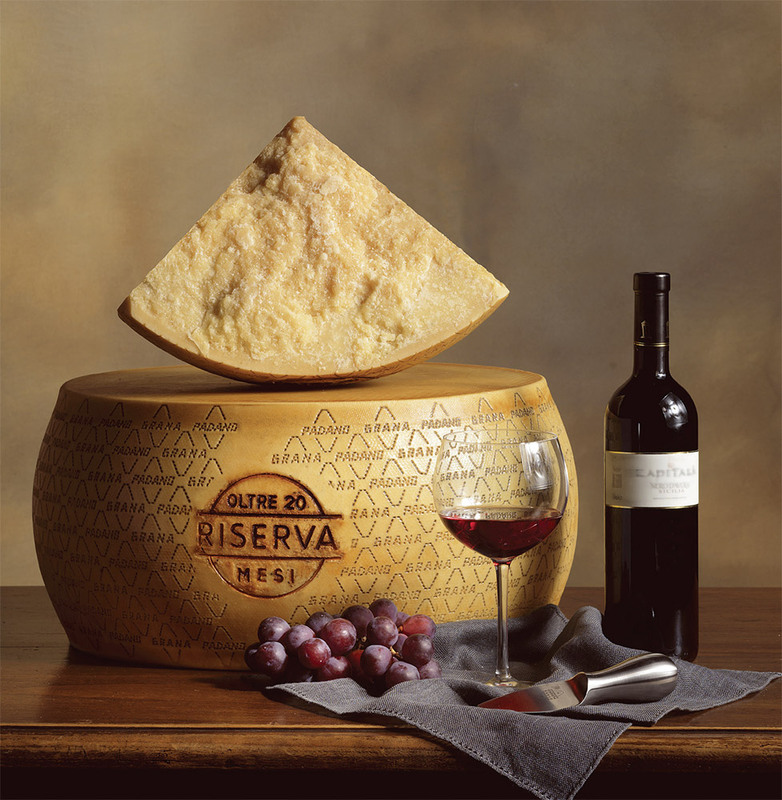 The characteristics of this cheese are enhanced by red wines low in tannin and fairly full-bodied, with a medium-to-long finish. They should be young, fresh wines, possibly rich in aromas and with notes that evoke the fragrance of the grapes from which they are made. This magical product, with its intense aromas of butter and hay, its balanced pungency and generous seasoning, once consumed leaves a rich after-taste that gradualy fades away. So, if we wish to enhance these sensations, the most appropriate wine will be a generous, bold and full-bodied nectar that ages well and has a long finish. 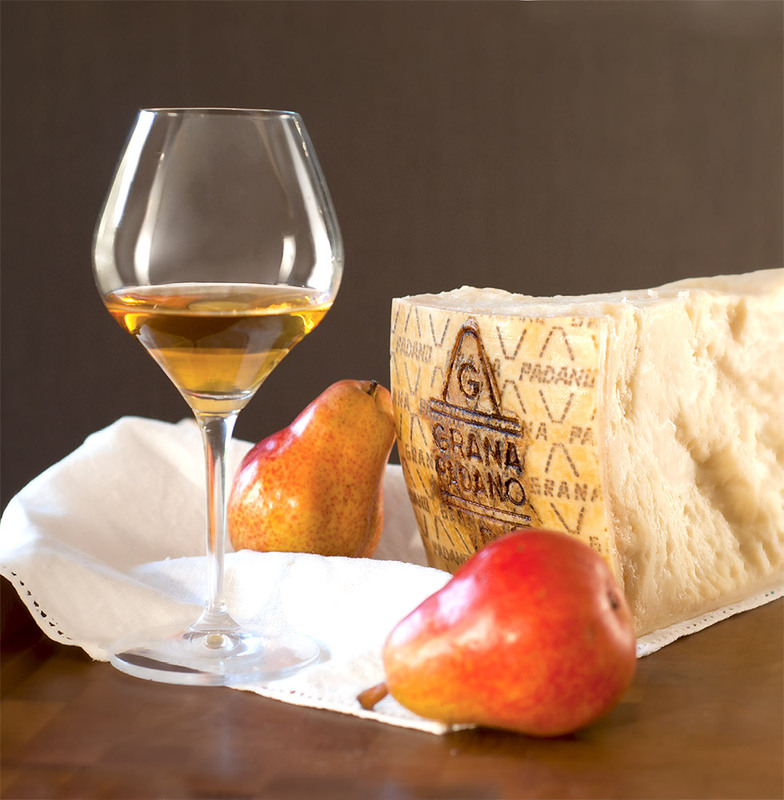 If, instead, you enjoy contrasting aromas and flavours, then you can choose to combine the cheese with passito dessert wines, which tone down the somewhat assertive streak of Grana Padano Reserve, and restore harmony and balance to the palate. We are now ready to set out on a journey through the various regions of Italy, taking us through the kaleidoscopic world of local wines whose multifaceted and diverse characteristics make for excellent accompaniements to this extraordinary and versatile protagonist in Italy's gastronomical basket. White Trebbiano and red-rosé Cerasuolo. The white wines Fiano, Coda di Volpe, Falanghina, Greco di Tufo and Lacrima Christi create a perfectly combination. Costa di Amalfi for rosé wines and the red wine Piedirosso. The white wines Ortrugo, Pignoletto and Albana, and the three versions of Lambrusco: the bright pink Sorbara, the cherry-coloured Grasparossa and the dark purple Salamino di Santa Croce. The white wines Tocai, nowadays known as Friulano, Ribolla Gialla, Verduzzo Friulano and Malvasia Istriana, and for those who love red wine, Terrano and Franconia. Pignolo as red wines; Picolit and Ramandolo as passito wines. The white wines Pigato, Lumassina and Vermentino, particularly the variety made in the Colli di Luni on the east coast, and as red wines Rossese di Dolceacqua. Colli di Luni Rosso and Ormeasco di Pornassio. Riesling Italico and Lugana as white wines, Chiaretto della Riviera del Garda Bresciano as a rosé, and as red wines, a young and lively Bonarda or Lambrusco from Mantua. Rosso della Valtellina and Botticino. Valcalepio Passito and Moscato di Scanzo. Verdicchio dei Castelli di Jesi, Verdicchio di Matelica, Pecorino di Offida and Passerina as white wines, and among the red wines Lacrima di Morro d’Alba. The white Biferno, the rosé from Terra degli Osci, and the red Pentro Rosso. Arneis, Favorita and Cortese dell’Alto Monferrato as white wines, Ciaret and Vespolina as rosé wines, and the red wines Dolcetto d’Alba, Dolcetto d’Asti, Grignolino and Freisa, of which we suggest the sparkling version. Barolo, Barbaresco, Gattinara, Ghemme, Boca, Sizzano, Fara, Bramaterra and Lessona. Loazzolo Passito. White Locorotondo, the group of rosé wines from Castel del Monte, Gioia del Colle, Salice Salentino, Leverano, San Severo, Lizzano, Copertino and Galatina, and the red wine Susumaniello. The various local versions of Vermentino and the red Monica di Sardegna. Grillo and Catarratto for lovers of white wine, the rosé Rosato dell’Etna, and Faro as the best of reds. Bianco Vergine from Val di Chiana, young Vernaccia and Ansonica for lovers of white wine. Bolgheri, Maremma, Carmignano a Capalbio rosé wines and a young Montescudaio as a red wine. Chianti Classico Riserva, Brunello di Montalcino, Vino Nobile di Montepulciano, Montecucco as red wines, and the non sweet version of Vin Santo as a passito wine. Nosiola for lovers of white wine and Marzemino as a red wine. Teroldego Rotaliano Riserva as a red wine and Vino Santo as a passito wine. The dry version of Orvieto and Grechetto as white wines and the red Rosso del Trasimeno. The white wines Petite Arvine and Blanc de Morgex, and the red wine Torrette. Bianco di Custoza, Soave Classico and Gambellara as white wines; Bardolino Chiaretto as a rosé and Bardolino Classico for those who prefer red.